This is a great origami craft for kids as it's easy and only takes a few minutes. If you are looking for an even simpler model, check the origami fox tutorial which is a great starting model for kids (and adults!). 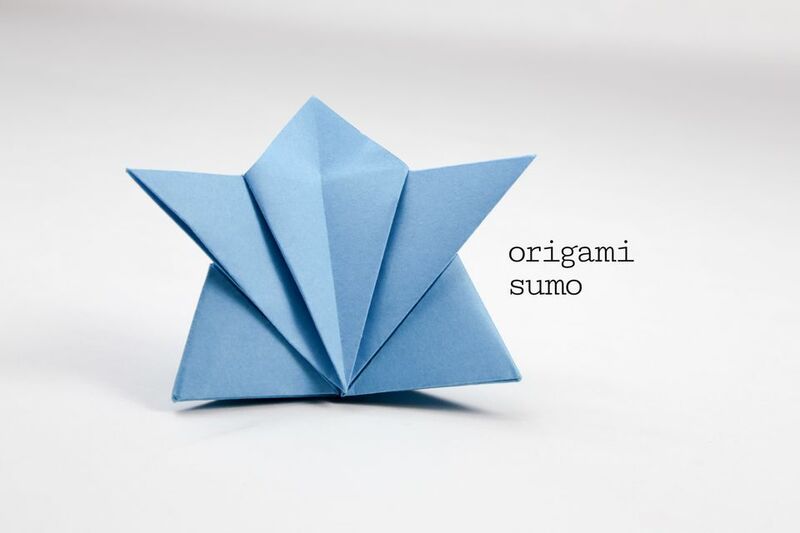 For another origami game, check out how to make traditional origami Menko cards. For this origami sumo, you will need just one sheet per sumo, I used thin paper that was 20 x 20 cm. For a nice small sumo, use 15 x 15 cm. If you use paper that has a white side, it will show on the back, but still looks nice. Check out how to make an origami blow top toy, which is also great for older kids. Fold the paper in half diagonally in both directions and unfold. 2. Fold a corner to the middle. 3. Fold the other corners to the middle. 4. Fold a corner to the middle. 5. Fold all the other corner to the middle. 6. Flip the model to the other side and rotate the paper. 7. Fold the left edge to the middle while releasing the flap on the back. 8. Fold it to the vertical line in the middle. 9. Fold the other side. 10. Fold the top down while releasing the flap on the other side. 11. Fold it to the middle. 12. Flip the model over to the other side. 13. Fold the bottom up as shown. 14. Fold the left side down to meet the bottom edge, stopping at the center line. 15. Do the same for the right side. 16. Fold both at the same time and squeeze the middle flap to create a little stand. 17. Turn it over and it is now done. You could fold the sumo in half vertically at this point and also fold the top of the head a little! Make another one so they can have a sumo match together! For more tutorials and also video tutorials, visit a youtube channel called Paper Kawaii.